You know how you might have taken a picture of something, and then years later are glad you did? I have so many pictures like that, but this one in particular is something I’m so glad I had the forethought to take. Cinema World (also known as the Eastgate Theater) in Greensburg, PA was one of those places that I have so many childhood memories from. It was one of the first theaters that I was allowed to go to with just my friends (and no parents!). I actually worked at the theater when we got word that it would be closing. After the theater closed, I remember thinking that it was probably the beginning of the end for that building as there aren’t took many uses for an old movie theater. I went out and took some pictures of the outside of the building, which I am glad I did as less than a year later it was torn down. I just wish that I had taken some pictures of the inside before it closed. As an interesting side note, I remember the day that the “M” on the marquee fell down. There had been a particularly nasty storm going on and we were all in the front lobby. All of a sudden, there was a crash and the “M” was on the ground! I’m sure if you are from Greensburg you probably remember this theater, however, here is some additional background for those who might be interested. 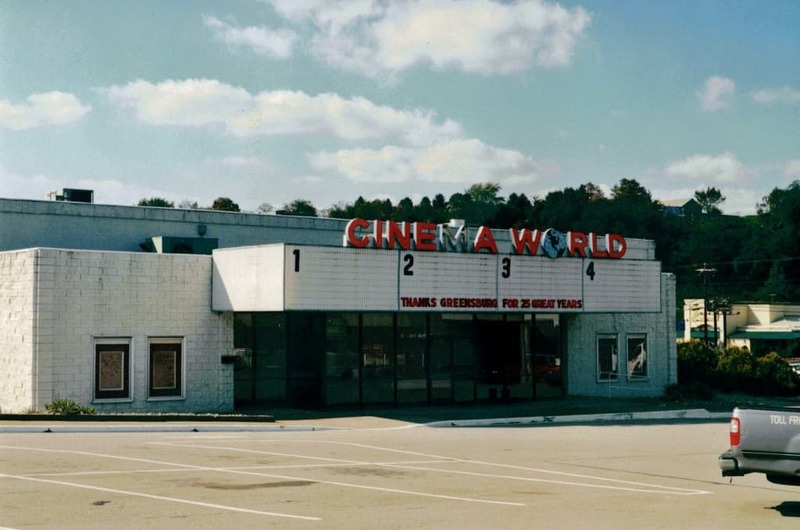 Cinema World opened in 1974 as a first-run, four-screen movie theater. It was, at the time, state of the art, with high quality picture and sound systems. I remember going there with friends in high school. It used to have small, slide-in pictures that would go above each theater door to let you know what movie was playing where, which is quite different than the digital displays in today’s theater. 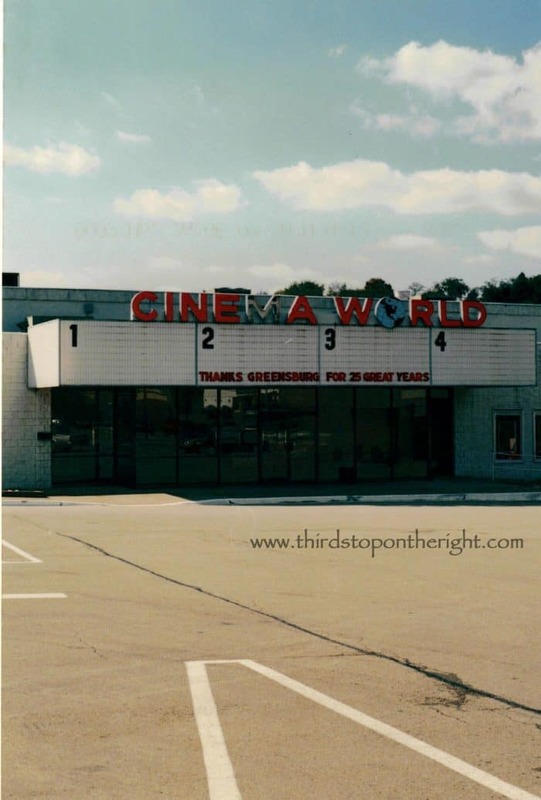 For years Cinema World reigned as one of the most popular theaters in the area, alongside the Greengate 3-screen theater, the 4-screen theater located in Westmoreland Mall, and the 4-screen Norwin Cinema location in Irwin. The Westmoreland Mall location and the Greengate locations were eventually closed with the opening of the new Carmike 15 theater, located in a strip shopping mall behind Westmoreland Mall. Cinema World continued to hang on for several more years, however, serving as a bargain theater. Movies would be sent to this theater for a second-run and admission cost only $2. However, all good things must come to an end, I guess, and the theater closed in 2000, after Carmike Cinemas filed for Chapter 11 Bankruptcy. The building sat empty for about a year before it was bought to be developed into a Krispy Kreme. Demolition began on the old theater in December 2001 and was completed by the end of the month. Krispy Kreme built a new building on the site which it ran for several years before it was replaced with a Chick-fil-A. Chick-fil-A still occupies the building. Didn’t VIP which became Tingles used to be right beside there?